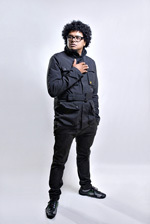 Joey Rasdien’s absurd yet thought-provoking stand-up comedy show tackles the touchy subject of evolution and how natural selection has blessed many of the figures that loom over South African life. Topics under scrutiny range from the devil and Charles Darwin to Julius Malema and Steven Hawking in a show that will make you laugh until tears are rolling down your face. Joey is the face of a new generation of South African comedy. He is instantly recognisable thanks to his roles in movies such as Running Riot, Bunny Chow, Vaatjie Sien Sy Gat, Dollars and White Pipes, Outrageous Blitz Patrollie and “Material” with Riaad Moosa. Joey wrote, co-produced and acted in his own sitcom “Rasdien” which was flighted on SABC 2. In addition, Rasdien has performed in many major comedy festivals in South Africa and is a regular on the comedy circuit at the country’s leading venues.